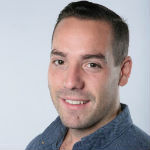 This post is inspired by Classy Pay Manager William Harris’ talk at the 2017 Collaborative—Increasing Conversions on Your Donation Form: Are You Donor-Centric Enough? The simile, “like riding a bike” is a popular phrase for a reason. Habits are a huge part of our daily lives. In fact, whenever we learn new behaviors—like riding a bike—our brains create neural pathways that form them into habit. The more we practice that behavior, the less we need to think about it. The formation of habits doesn’t only apply to riding a bike, driving a car, or brushing your teeth, though. Your nonprofit can create a donor experience, or journey, that makes giving to your cause a habit. And when your donors treat giving like a habit—your organization benefits from a recurring, predictable, and sustainable source of revenue. To make the donation process a habitual experience, it’s helpful to first understand how a habit is defined and created. When this knowledge is applied to how Classy can be used to build a donor journey that leads from a one-time donation to a recurring gift , you can create a community of avid, habitual supporters. To understand how to make giving a habit among your supporters, let’s look at a real world example. In the early 1900s, Pepsodent ad executive Claude Hopkins saw a direct correlation between habit and revenue. Before the arrival of his Pepsodent toothpaste advertising campaign, almost no Americans brushed their teeth. So, Hopkins designed an ad campaign that prompted people to run their tongue across their teeth. It claimed that they would feel a film, which is what made their teeth decay and appear yellow. He created a psychological connection between feeling film on your teeth and the desire to brush them—the cue. The routine was brushing your teeth, and the reward was a bright, clean smile. After a decade of running the campaign, over 50 percent of Americans brushed their teeth every day. That trend has powered forward into our modern day. Do you know anyone that doesn’t own a toothbrush? A slide from Harris’ presentation detailing the cue, routine, reward Hopkins built. 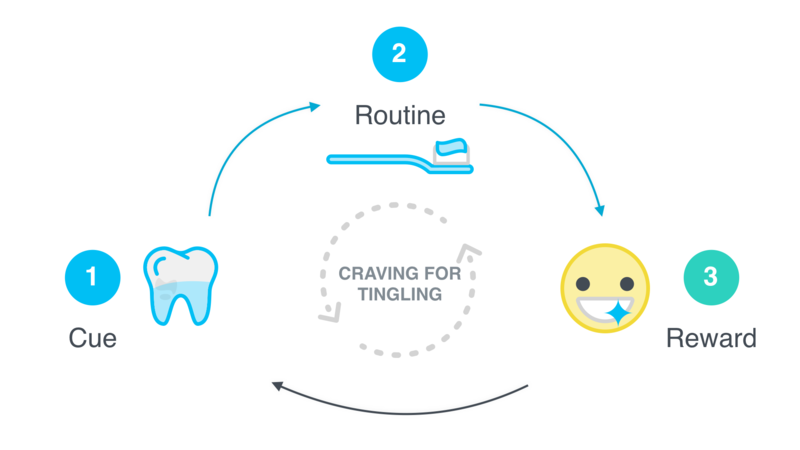 Hopkins built a narrative that took consumers on a journey, which culminated in them making it a habit to brush their teeth. For further reading about Claude Hopkins, his Pepsodent ads, and how humans form habits, read The Power Of Habit, by Charles Duhigg. While your nonprofit likely isn’t trying to sell toothpaste, you are selling an emotional and often psychological connection to your mission. The trick is to connect the dots for your supporters. Here are a few ways to establish a cue, routine, and reward system that grabs your supporters’ attention and makes giving to your organization a habit. For a lot of nonprofits, the cue lies in the ability to grab your audiences’ attention. What’s going to jump out at them and bring them in? One way to accomplish this on Classy is through striking, well-designed campaigns that sport your branding. You can also use Classy’s Impact Blocks to showcase the impact of a donation. Consider featuring high quality photos of your beneficiaries with succinct text snippets that communicate how the donation helps. 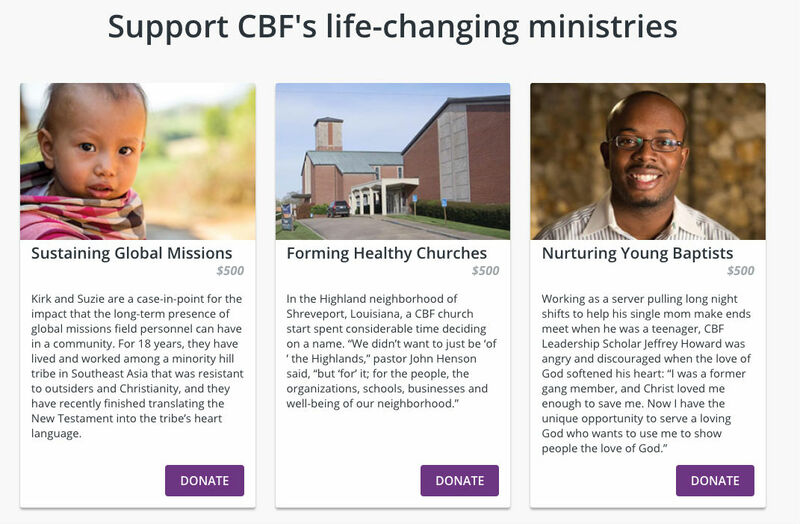 The Impact Blocks from Cooperative Baptist Fellowship’s campaign. The end result of a successful cue, in this case, is when a visitor clicks on the “Donate” button on your campaign page. After the cue, work on creating the routine. When a visitor clicks the “Donate” button on a campaign page it takes them to a donation form. Routine comes into play when people navigate and fill out this form. This is where the right fundraising software, and well-built donation forms, is crucial to success. 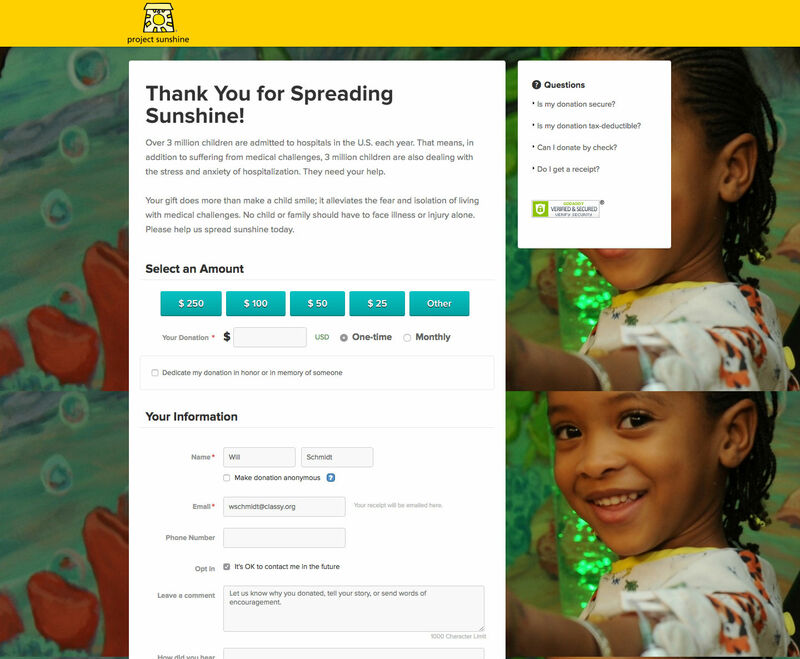 Project Sunshine’s well-designed, modern donation form on Classy. The average person encounters many forms of checkout forms online in their day-to-day. These repetitious actions with different checkout forms shapes how individuals expect and prefer to pay for things. If your donation form doesn’t fit with modern trends in the online checkout realm, you’re going to lose people during this important step. And that’s underscored by the rise in mobile use when shopping and checking out. Is your page going to deter someone because it isn’t mobile responsive? Whether someone visits your page from desktop or mobile, it’s essential that anything that might distract a user from converting is avoided. A tedious form with distractions interrupts the cognitive process that forms a habit. 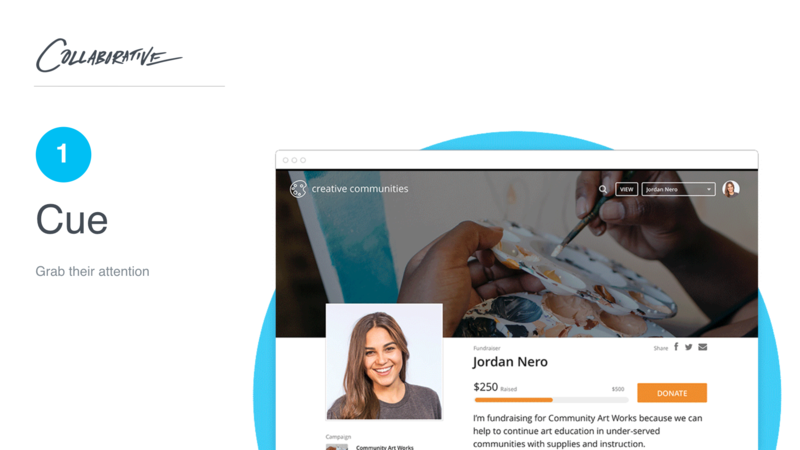 Plus, a streamlined page that’s easy and quick to fill out means more donations for your cause. When someone clicks on the “Give Now” button, their brains are flooded with small amounts of serotonin. The reward here is, quite literally, clicking that button. But it doesn’t have to stop there. What matters most is creating an emotional response that comes. This is where you cement the habit of giving. Not only do we strive to make donation forms more efficient for your organization, we work to make them easy to use for your supporters as well. The faster they can get through the checkout process, the more revenue you’ll be able to bring in. In the giving process, there is a moral and emotional reward for the impact that you create as a donor. Without this reward, or any reward, it’s difficult to form habits. In an ideal world, a successful journey that builds a habit in your donors could have multiple end-points. Maybe it’s creating an emotional connection that brings a donor back to your future fundraising initiatives. Perhaps it’s cementing a one-time donor as a recurring donor. If you’re interested in learning more about how Classy can foster this journey, use the form below to talk with an expert today.